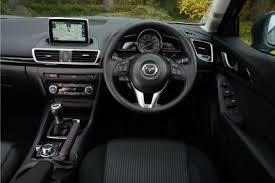 In this second instalment, I thought I’d provide my views on how the Mazda3 drives. I count myself as someone who is normally immune to whatever slogan/ brand strap-line nonsense a company’s marketing team and/ or agency throws at a product or service that they are trying to sell. Actually, that’s not quite correct as a statement; normally such nonsense prejudices me against whatever is being advertised, promoted or sold. I may be showing my bias towards my new purchase, or just indulging in a little subconscious post-purchase decision re-enforcement, but, after recent drives in the 3, I have twice found myself trying to recall marketing messages in the various pieces of Mazda brochure-ware I have lately consumed. One of these is “Jinba Ittai” which, apparently, means, “horse and rider becoming one” in Japanese, and has been used by Mazda in its messaging relating to the incoming MX-5. Re-reading it on the screen, I am almost squirming with embarrassment, but the Mazda3 is a very driver-orientated car; indeed, almost too much so. Hence, slap me, but I’m beginning to believe some of that hype. Let me re-start back at the beginning. Open the (light) driver’s door, sit in the driver’s seat, swing your legs in, and the main controls are all very nicely sited. After a few weeks of driving it, I decided that the driving and ownership experience of this car would be heightened by lowering the seat to its lowest point. I’ve never had that thought before, but, in this car it feels just so. The wheel is a nice, smallish size (although not new-Peugeot-small). It’s covered in fine quality leather (it has that slightly matt finish) over a firm rim so that it is cool to the touch and slightly damped, but with no hint of squidge. It feels good to hold. There are switches and controls on the spokes, but I’ll cover those another time. The wheel can be adjusted for height and reach for attaining a comfy environment, whatever your size or preference. Pedals are well placed straight ahead and nicely spaced too. The seat has a high back, is nicely bolstered, and is blessed with good thigh support, although it has taken me time to find the right height and position for the head-rest – it seems to be angled a little aggressively for my size and shape. 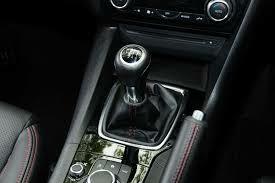 The placing of the hand-brake and gear-lever is excellent, the gear-change is even better! The placing of the gear-stick and handbrake (both manual) are, again, nice and snug – the latter especially as it is slightly angled inwards towards the driver and helps with the feeling that it’s an intimate environment, with all the key controls designed around the driver. I’ve had a two-seat, mid-engined sports car in my past, and it did not feel as driver-focussed as this to sit in. Starting up involves depressing the (firm but positive and well weighted) clutch and pressing the flashing START button (that’ll be part of another instalment) and the engine instantly flicks into life. It races for a few seconds, quite loudly, but then settles to a very steady idle which is quiet and not really diesel-like – in fact it reminds me of my Dad’s old S-Series (petrol) engined Montego. Depress the clutch, snick the gearstick into first gear and go. It’s all very slick, consistently weighted and cohesive. The engine pulls cleanly and vigorously, like being on the end of a chain (I’m used to the much more elastic feel of the diesel C6). Quickly into second, third, etc. … the gear change indicator on the left side of the dash requests that you change up early, but it’s no hardship. The gear-change is a stand-out feature of the drive, which says a lot because there is a lot to like. The short-ish stick is topped by a well sized pommel that is on the small side and nicely shaped. It’s interesting how the mind works, making assumptions about things that stop you actually noticing them; I write this as for a few weeks I could have sworn the gear-knob was wrapped in the same leather as the wheel, but no, it’s only some vinyl/ plastic. The movement is short-throw, well-oiled, with a light, positive, snicking action as the lever engages gear at the end of its travel. Every now and again it snags, but I’m convinced that some of that is due to induced laziness on my behalf. Ninety-nine percent of the time it’s a real pleasure, and makes for a Torvill-and-Dean style partnership with the clutch. The engine is another strong point – powerful, torquey, smooth and pretty quiet as it revs out happily (but unnecessarily) to its red-line. Tuneful it is not (it makes me appreciate what a lovely tone the V6, indirect injection diesel manages in the C6), but neither is it unpleasant. I wonder whether it will stay as quiet as the miles are piled on, but the engine suits the car very well and is gradually becoming more and more economical (the average has risen from 56 MPG to 58 over the 3,500 miles since I have had it). The travel of the accelerator pedal could do with having a bit more depth to it, but I think this is a consequence of Mazda going for one of those floor hinged organ pedal type arrangements. An early driving impression as one heads off up the road is the sense of torsional rigidity of the body-shell. I have yet to find anything which states what it measures and how it compares, and I know it’s a new car, but it feels very rigid. Nothing creeks, groans, rattles, or squeaks, and moreover, the chassis feels like an integrated whole with the rest of the car. The steering, via that nice wheel and rim, is well weighted, with a meaty feel that demands a bit of heft. Again, the rack feels very well located and integral. Thanks to the wheel castor angle (so I have read elsewhere …) there is a nice bit of feel to it too – unusual for EPAS (so I believe) and a bit of a shock to my system given the aloof C6 and squidgy Picasso that have dominated my driving life these past 5 years. This is all in empathy with a chassis that is tautly pliant, with well-judged damping and body control. It patters over imperfections (they simply don’t exist in the C6) and thumps a little into pot-holes (the C6 is far worse on this front), but I’d say that the ride is very acceptable.There will be no complaints of travel sickness that arise from this Mazda’s ride (they might as a result of claustrophobia caused by the environment in the rear of the car, but, again, that’s for another instalment). The car is very well planted on a motorway cruise, and responds with controlled aplomb under rapid braking. Overall, this is a set-up which makes you feel connected to the road, is comfortable enough, and installs a sense of confidence. This confidence means that, if you are in the mood, you can exploit some really nimble and light-footed handling, with excellent road-holding and strong grip. This in turn introduces you to a very neutral cornering attitude (as long as you’re not abusive, understeer is not much of a feature), with very well controlled roll-angles and that very pleasing “pivot around the driver” sensation that one reads about elsewhere and which I had thought had gone out of production in mid-sized hatches with the Mk1 Focus. I don’t know what this says about this class of car over recent years, but that’s the car of which the 3 most reminds me, and it’s certainly the most enjoyable of its type that I have driven since the 2.0 Zetec that I used to regularly be given as a hire car. Completing the positive picture are the brakes, which are powerful and benefit from a positive pedal feel. All round, this is a very cohesive, competent and enjoyable dynamic package. The downside, and it’s a significant one, is road noise. I know (now) that I have been spoilt by the terrifically isolated C6, but the din coming off the tyres and into the cabin is intrusive and becomes tiresome over time. Obviously, it’s very surface sensitive, but, at speed on certain stretches of the M1, it’s poor. I’ve had a look under the wheel arches, and it looks like the only wheel lining on the cabin side of the arch is an exposed, felt-like material. It’s odd – like nothing I have come across before – and one of a few areas that look like the result of attempts either to reduce weight (one of the pillars of Skyactiv – the “eco-moniker” worn by every Mazda these days) or, less acceptably, to reduce production costs (more on this another time). If my daily drive were further and covered more motorway miles, the level of road noise might have been a deal breaker. It irritates me, because, in many other respects, mechanically the 3 is a refined car, and wind noise is low for a car without laminated side-windows. As it is, I’ll put up with it, because in so many compensating ways, the car provides a rewarding drive. As such, hopefully you can now understand a little why I think there is something in the brochure-spiel of Jinba Ittai . Owning this car makes me realise how poor cars such as the Citroen C4, Peugeot 308 and ordinary-spec Megane really are in this respect. I have not driven the latest generation of the Golf and Focus, both of which receive good press in the driving department, so I can only speculate that the 3 is somewhere in that echelon. There are other aspects of the car that impress me less; I have touched on them in this piece and will expand further in due course. For now and in case I have left you in any doubt, road-noise aside, I can recommend the 3 as a very enjoyably set up, mildly sporting, small-to-mid sized four door saloon, which can be appreciated for its dynamic qualities however you feel like driving it. It is interesting that you mention the mark 1 Focus, as that is exactly the car my wife’s CX5 puts me in mind of (I owned a 2 litre Zetec you mentioned). When hustled, the Mazda simply gets on with the business of covering maximum ground with minimum fuss. There is very little slop in the suspension, nor the major controls; all are well judged in terms of damping and feedback. As a result actual information about the road comes through to the driver, enough to make the act of driving a pleasurable sensation. The feedback forms an unceasingly entertaining conversation between you, the car and the road, incepting the idea that the car is working with you, not against you. It is this tactility that manufacturers often neglect; the simple pleasure of mechanical interfaces. Keen drivers or not, people pick up on this; it is the reason I still go misty eyed when I remember that mark 1 Focus, despite owning and driving many supposedly superior cars over the years. It is also one of the primary reasons my wife is already referring to the CX5 as the best car she has ever owned. as both those cars are. I drove a 306 at some point and I was pleased with that. Only a head to head would be enough to tell which after 20 years was the better of the pair. Thanks for that article- I feel like I am getting to know the car in a meaningful way. How does the boot cope with family junk? I intend to cover the 3’s attributes as family transportation in the next instalment. Dear S. V. Robinson. Refreshing review. Currently I own a ’58 plate Mazda 3 1.6 Sport. This has given me over 56k miles of hassle-free, responsive, fun, sometimes “nippy” driving. During this time I have had people bump me (can’t see a big red car!) and have had use hire cars; recently a new Ford Focus diesel; boy, was I glad to get my Mazda back! Thinking along the same lines, EU cars are so much dearer and usually not so reliable or so well engineered as the Mazda, I’ve looked and looked at various alternatives. However, I’m frustrated by the lack of competition and keep coming back to the 3; build, drive, economy/emissions, practicality, cost. Nothing else compares!